The mid-ocean islands of the Seychelles boasts of many unique attributes, but they remain popular for their white sandy beaches that is clean, that are lapped by turquoise blue seas that is clean, clear and warm, and inhabited by the friendly Creole population simply called Seychellois even in its diversity. 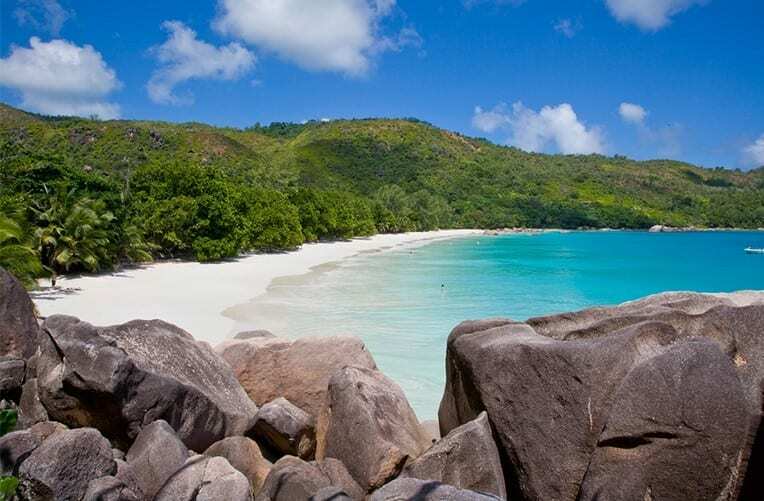 Seychelles was uninhabited until settled by the French and later to be conquered by the British giving the islands a historical taste as a French Department and that of a British Colony. Today an Independent Republic (since 1976). Seychelles is a country full of cultural and historical wealth and is blessed with an array of natural attractions and unique flora and fauna that remains very much undisturbed due to its location in the middle of the Indian Ocean. Why visit now? The troubled world we live in pushes the discerning travelers to look for a holiday in a destination that is considered safe. That is where Seychelles stands ahead of the pack. At a recent conference on trends and attractions of holiday destinations, ‘safety and security’ came up as top in the list of most sought-after unique selling points. Seychelles it is known offers ‘safety and security’ plus a lot more, and in the troubling world considered tourism source markets for many destinations, would be holiday makers can choose Seychelles knowing that this is a guarantee. The other attractions of the islands will be the ‘cherry on the cake’ for holiday makers. The peace-loving Seychellois all know that tourism is the pillar of their island’s economy and every single Seychellois appreciate this industry that also provides employment for the population. At the recent tourism conference, the idea that what is good for tourists is also good for the islanders in Seychelles made many smile. Yet this is so true for Seychelles. For example, the Fast Ferry operation, Cat Cocos linking the main island of Mahe to the islands of Praslin and La Digue and also the Cat Roses operation linking Praslin and La Digue virtually all day are primarily tourism facilities but benefiting the local Seychellois population as well. Removing these ferries will not create a tourism disaster because tourism excursions will continue through other forms, but instead it will create a riot by the Seychellois who have all become attached to these regular, safe but also speedy services. So many such examples can be cited in Seychelles. ‘Safety and Security’ also covers the concept that no five-star hotel and resort can be constructed and operated in a slum with people sleeping on the road or in cardboard boxes. This notion is considered as un-tourism and in Seychelles this is not happening. Tourists cannot feel safe when leaving their five-star establishment and having to experience this treatment of the poor, the homeless and of the vulnerable member of the population where they are holidaying. Seychelles is a working one and takes good care of its visitors.